We had a great time at Oscar Blues – the weather cooperated – the rain stopped – and it didn’t get too hot. 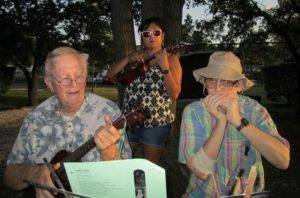 David, Marty, and Ashley rocking out on Toot Toot. 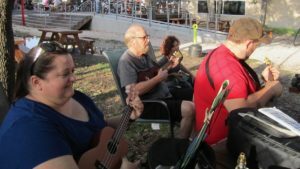 Laura, Eric, Stephanie and Brad- Eric and Brad are playing a loaner ukes! The infection is spreading! 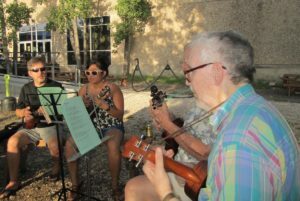 We had a great time – we’ll plan for another Uke- for sometime in September – check back for the date. 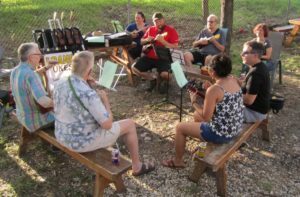 If you’d like the song sheet from our July meeting – here you go. TUG_JULY18.